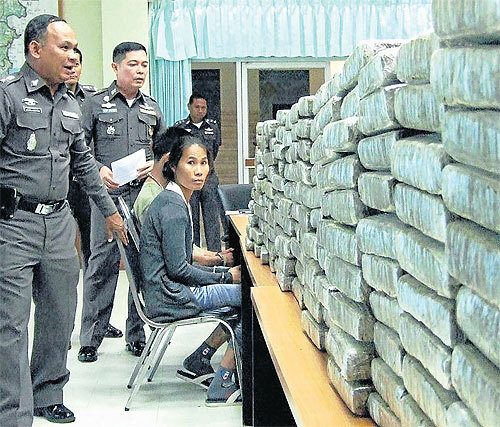 A husband and wife were arrested for possession of over 500kg of marijuana worth more than 20 million baht in Chumphon's Pathiu district yesterday. Police at a checkpoint on Phetkasem Road stopped a goods delivery pickup truck for a search about 6pm. Anucha Kongroi, the 36-year-old driver, told the police that he and his wife, Eed, were delivering snacks to a department store in Surat Thani, Chumphon police chief Pol Maj Gen Erb Kongklam said. However, when asked to open the container and show his delivery document, Mr Anucha said he had neither a key for the container nor the papers. Police searched his body and found the key in his pocket. Inside the container, police found marijuana bars stacked in 13 sacks, weighing 510kg. Pol Maj Gen Erb said the marijuana cost about 20 million baht. Mr Anucha allegedly confessed he was hired to take the marijuana from Nonthaburi province to deliver to customers in Surat Thani. In another case, Songkhla police arrested four people and seized 62kg of marijuana and 11 guns in separate operations in Hat Yai district recently. Chatwat Khamnurak, 30, and Sakareeya Mad-adam, 43, were nabbed at a checkpoint on Phetkasem Road while allegedly trying to take the marijuana into Hat Yai municipality. Police seized 62kg of marijuana worth 1.8 million baht from the suspects. Mr Sakareeya was shot and injured during the arrest. In another operation, police arrested Pinyo Suwankhong, 48, and Pipat Kaewmongkol, 49, and seized a total of eleven guns including a 5.56mm rifle. The rifle was thought to belong to the state. The arrest was made near a flea market in tambon Khuan Lang as the suspects were about to hand over a gun to police who had set up a sting operation. Police had asked to buy a small rifle for 62,000 baht.